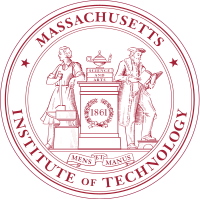 The Massachusetts Institute of Technology (MIT) is a private research university in Cambridge, Massachusetts. Founded in 1861 in response to the increasing industrialization of the United States, MIT adopted a European polytechnic university model and stressed laboratory instruction in applied science and engineering. The Institute is a land-grant, sea-grant, and space-grant university, with a campus that extends more than a mile alongside the Charles River. Its influence in the physical sciences, engineering, and architecture, and more recently in biology, economics, linguistics , management, and social science and art, has made it one of the most prestigious universities in the world. The Massachusetts General Court is the state legislature of the Commonwealth of Massachusetts. The name "General Court" is a hold-over from the earliest days of the Massachusetts Bay Colony, when the colonial assembly, in addition to making laws, sat as a judicial court of appeals. Before the adoption of the state constitution in 1780, it was called the Great and General Court, but the official title was shortened by John Adams, author of the state constitution. It is a bicameral body. The upper house is the Massachusetts Senate which is composed of 40 members. The lower body, the Massachusetts House of Representatives, has 160 members. It meets in the Massachusetts State House on Beacon Hill in Boston. A liberal education is a system or course of education suitable for the cultivation of a free human being. It is based on the medieval concept of the liberal arts or, more commonly now, the liberalism of the Age of Enlightenment. It has been described as "a philosophy of education that empowers individuals with broad knowledge and transferable skills, and a stronger sense of values, ethics, and civic engagement ... characterised by challenging encounters with important issues, and more a way of studying than a specific course or field of study" by the Association of American Colleges and Universities. Usually global and pluralistic in scope, it can include a general education curriculum which provides broad exposure to multiple disciplines and learning strategies in addition to in-depth study in at least one academic area. MIT has substantial commercial real estate holdings in Cambridge on which it pays property taxes, plus an additional voluntary payment in lieu of taxes (PILOT) on academic buildings which are legally tax-exempt. As of 2017 [update] , it is the largest taxpayer in the city, contributing approximately 14% of the city's annual revenues. Holdings include Technology Square, parts of Kendall Square, and many properties in Cambridgeport and Area 4 neighboring the educational buildings. The land is held for investment purposes and potential long-term expansion. Lithium-ion battery efficiencies – Yet-Ming Chiang and his group at MIT showed a substantial improvement in the performance of lithium batteries by boosting the material's conductivity by doping it  with aluminium, niobium and zirconium. MIT OpenCourseWare – the OpenCourseWare movement started in 1999 when the University of Tübingen in Germany published videos of lectures online for its timms initiative (Tübinger Internet Multimedia Server). 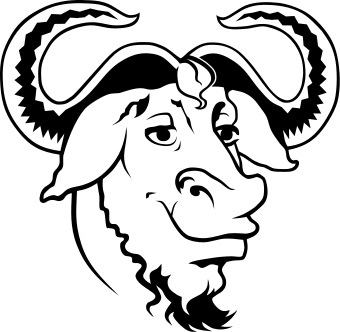 The OCW movement only took off, however, with the launch of MIT OpenCourseWare and the Open Learning Initiative at Carnegie Mellon University  in October 2002. The movement was soon reinforced by the launch of similar projects at Yale, Utah State University, the University of Michigan and the University of California Berkeley. SKETCHPAD – invented by Ivan Sutherland at MIT (presented in his PhD thesis). It pioneered the way for human–computer interaction (HCI). Sketchpad is considered to be the ancestor of modern computer-aided design (CAD) programs as well as a major breakthrough in the development of computer graphics in general. As of 2013 [update] , MIT had 1,030 faculty members. Faculty are responsible for lecturing classes, for advising both graduate and undergraduate students, and for sitting on academic committees, as well as for conducting original research. Between 1964 and 2009 a total of seventeen faculty and staff members affiliated with MIT won Nobel Prizes (thirteen of them in the latter 25 years). MIT faculty members past or present have won a total of twenty-seven Nobel Prizes, the majority in Economics or Physics. As of October 2013 [update] , current faculty and teaching staff included 67 Guggenheim Fellows, 6 Fulbright Scholars, and 22 MacArthur Fellows. Faculty members who have made extraordinary contributions to their research field as well as the MIT community are granted appointments as Institute Professors for the remainder of their tenures. As of 2014 [update] former provost Robert A. Brown served as president of Boston University; former provost Mark Wrighton is chancellor of Washington University in St. Louis; former associate provost Alice Gast is president of Lehigh University; and former professor Suh Nam-pyo is president of KAIST. Former dean of the School of Science Robert J. Birgeneau was the chancellor of the University of California, Berkeley (2004–2013); former professor John Maeda was president of Rhode Island School of Design (RISD, 2008–2013); former professor David Baltimore was president of Caltech (1997–2006); and MIT alumnus and former assistant professor Hans Mark served as chancellor of the University of Texas system (1984–1992). In addition, faculty members have been recruited to lead governmental agencies; for example, former professor Marcia McNutt is president of the National Academy of Sciences,  urban studies professor Xavier de Souza Briggs served as the associate director of the White House Office of Management and Budget,  and biology professor Eric Lander was a co-chair of the President's Council of Advisors on Science and Technology. In 2013, faculty member Ernest Moniz was nominated by President Obama and later confirmed as United States Secretary of Energy. Former professor Hans Mark served as Secretary of the Air Force from 1979 to 1981. Alumna and Institute Professor Sheila Widnall served as Secretary of the Air Force between 1993 and 1997, making her the first female Secretary of the Air Force and first woman to lead an entire branch of the US military in the Department of Defense. Noted alumni in non-scientific fields include author Hugh Lofting,  sculptor Daniel Chester French, guitarist Tom Scholz of the band Boston, the British BBC and ITN correspondent and political advisor David Walter, The New York Times columnist and Nobel Prize Winning economist Paul Krugman, The Bell Curve author Charles Murray, United States Supreme Court building architect Cass Gilbert,  Pritzker Prize-winning architects I.M. Pei and Gordon Bunshaft. Franklin W. Olin College of Engineering is a private undergraduate engineering college in Needham, Massachusetts, adjacent to Babson College. Olin College is noted in the engineering community for its youth, small size, project-based curriculum, and large endowment funded primarily by the F. W. Olin Foundation. The college covers half of each admitted student's tuition through the Olin Scholarship. The Madras Institute of Technology (MIT) is an engineering institute located in Chromepet, Chennai (Madras), India. It is one of the four autonomous constituent colleges of Anna University It was established in 1949 by Chinnaswami Rajam as the first self-financing engineering institute in the country, and later it merged with Anna University. The institute was at that time an experiment in technical education, for it introduced to India new areas of specialization: aeronautical engineering, automobile engineering, electronics engineering and instrumentation technology. MIT was the first self-financing college opened in India. Susan Hockfield is an American neuroscientist who from December 2004 through June 2012 served as the sixteenth president of the Massachusetts Institute of Technology. Hockfield succeeded Charles M. Vest and was succeeded by L. Rafael Reif, who had served in her administration as Provost. Hockfield was the first biologist and the first woman to serve as the Institute's president. Hockfield, Professor of Neuroscience in MIT's Department of Brain and Cognitive Sciences and a member of the Koch Institute for Integrative Cancer Research, is a director of General Electric and of Qualcomm. She is an overseer of the Boston Symphony Orchestra, a trustee of the Carnegie Corporation of New York, and a member of the MIT Corporation. Before returning to MIT following her presidency, Hockfield held the Marie Curie Visiting Professorship at Harvard University's John F. Kennedy School of Government. Yeungnam University is a private research university, located in Gyeongsan, North Gyeongsang, South Korea. The university's predecessors, Taegu College and Chunggu College, were founded in Daegu in 1947 and 1950 respectively. In 1967, the two colleges merged by President Park Chung-hee to form the degree-granting Yeungnam University. In 1972, the university's new main campus opened in Gyeongsan east of Daegu. 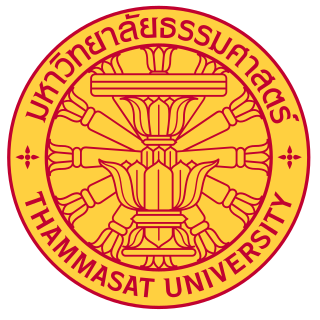 The university includes colleges of Law and Medicine and a teaching hospital. The School of Arts and Sciences (A&S) is the largest of the eight schools and colleges that comprise Tufts University. Together with the School of Engineering, it offers undergraduate and graduate degrees in the liberal arts, sciences, and engineering. The two schools occupy the university's main campus in Medford and Somerville, Massachusetts and share many administrative functions including undergraduate admissions, student affairs, library, and information technology services. The two schools form the Faculty of Arts, Sciences, and Engineering (AS&E), a deliberative body under the chairmanship of the president of the university. Currently, the School of Arts and Sciences employs approximately 540 faculty members. There are over 4,300 full-time undergraduates and 1700 graduate and professional students. Robert A. Brown is the 10th president of Boston University. He was formerly the provost of MIT. The Manipal Institute of Technology is a constituent institution of Manipal Academy of Higher Education that specializes in the fields of engineering and technology. MIT contains 16 academic departments and awards undergraduate, graduate and post graduate degrees. Established in 1957 in Manipal, Karnataka, India, it is one of the first self-financed colleges in India. It has been consistently ranked as one of the top colleges in India for engineering education. Regis College is a private Roman Catholic university located on a 132 acres (0.53 km2) former estate in the suburb of Weston, Massachusetts. The college is approximately 12 miles (19 km) from downtown Boston. Regis was founded as a women’s college in 1927. In 2007, Regis became co-educational. It was the last Catholic women's college in the Boston area to start admitting men. Massachusetts College of Pharmacy and Health Sciences is a private university focused on medical programs and located in the Longwood Medical and Academic Area of Boston, Massachusetts. The university provides traditional and accelerated programs of study focused on professional education in pharmacy and the health sciences. Since 2000, MCPHS University has expanded to include two additional campuses, located in Worcester, Massachusetts, and Manchester, New Hampshire. 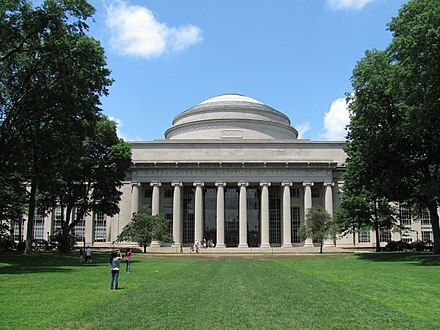 The history of the Massachusetts Institute of Technology can be traced back to the 1861 incorporation of the "Massachusetts Institute of Technology and Boston Society of Natural History" led primarily by William Barton Rogers. The National Taiwan University of Science and Technology, commonly referred to as Taiwan Tech, is a public/national technological university located in Taipei, Taiwan. Taiwan Tech was established in 1974, as the first and the leading higher education institution of its kind within Taiwan's technical and vocational education system. Taiwan Tech is one of Asia's 10th rank as the best institute in science and technology. Academics at the Massachusetts Institute of Technology are organized into 6 divisions containing 32 academic departments or faculties along with many interdisciplinary, affiliated, and intercollegiate research and degree programs. The Schools of Engineering, Science, Sloan School of Management, Humanities, Arts, and Social Sciences, Architecture and Urban Planning, and the Whitaker College of Health Sciences and Technology. The Koch Institute for Integrative Cancer Research at MIT is a cancer research center affiliated with the Massachusetts Institute of Technology (MIT) located in Cambridge, Massachusetts, United States. The Institute is one of eight National Cancer Institute-designated basic research centers in the United States. Fariborz Maseeh is an Iranian-born Iranian-American pioneer in the field of micro-electro mechanical systems (MEMS) and philanthropist who founded IntelliSense in 1991 and sold it in 2000. He is the founder and managing principal of Surlamer LLC, an investment management firm which invests in various assets and manages several proprietary traded hedge funds. He is the founder of Kids Institute for Development and Advancement (KiDA), an Irvine, California, treatment clinic and education facility for autistic children. He is the founder of Orbitron LP, a global macro long-short hedge fund. He is the founder and president of The Massiah Foundation, a charitable organization.. The University of Washington Department of Bioengineering is a joint department of the College of Engineering and School of Medicine, and is located in Seattle, Washington, USA. ↑ As of September 14,2018 [update] . "Report of the Treasurer for the year ended June 30, 2018" (PDF). Office of the Vice President for Finance. 2018. 1 2 3 "Faculty and Staff". MIT Facts. MIT. Retrieved March 11, 2014. 1 2 "The Campus". MIT Facts 2018. Retrieved November 11, 2018. ↑ "MIT Facts 2018: Faculty and Staff". web.mit.edu. Retrieved March 7, 2019. ↑ "Statistics". www.marshallscholarship.org. Retrieved March 8, 2019. ↑ "NASA Chooses Three MIT Alumni to be Astronauts". alum.mit.edu. Retrieved March 7, 2019. ↑ "MIT Facts 2018: Entrepreneurship and Innovation". web.mit.edu. Retrieved April 15, 2018. ↑ "Entrepreneurship and Innovation at MIT (December 2015)" (PDF). MIT. ↑ "Massachusetts Institute of Technology | Association of American Universities". www.aau.edu. Retrieved August 17, 2018. ↑ "MIT Timeline". MIT History. MIT Institute Archives. Retrieved April 1, 2015. ↑ Angulo, A.J. "The Initial Reception of MIT, 1860s–1880s". In Geiger, Roger L. (ed.). Perspectives on the History of Higher Education. pp. 1–28. ↑ "Morrill Act:Primary Documents of American History". Library of Congress . 2016. Retrieved February 10, 2016. 1 2 Prescott, Samuel C (1954). 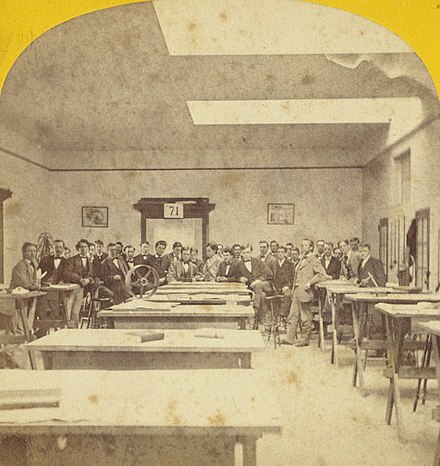 When MIT Was "Boston Tech", 1861–1916. MIT Press. ↑ "Explore campus, visit Boston, and find out if MIT fits you to a tea". December 16, 2006. Retrieved December 16, 2006. 1 2 3 Alexander, Philip N. "MIT-Harvard Rivalry Timeline". MIT Music and Theater Arts News. Massachusetts Institute of Technology. Retrieved July 7, 2014. ↑ "MIT150 Exhibition Nomination". museum.mit.edu. ↑ "Wartime Strobe: 1939–1945 – Harold "Doc" Edgerton (Doc's Life)" . Retrieved November 28, 2009. 1 2 Todd, Richard (May 18, 1969). 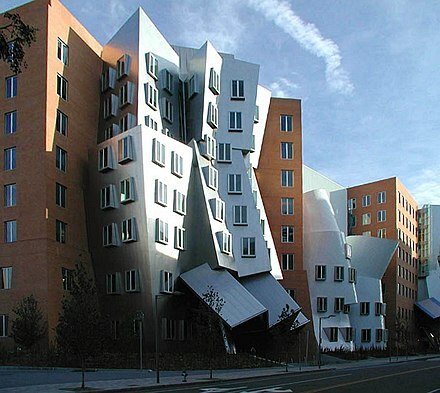 "The 'Ins' and 'Outs' at MIT". The New York Times. ↑ <Please add first missing authors to populate metadata.> (February 28, 1969). "A Policy of Protest". Time . Retrieved August 13, 2008. ↑ 'Battering Ram: The occupation of the president's office', The Tech, 14/12/71 p. 4 and The Tech, 4/8/72; M.Albert, Remembering Tomorrow pp. 9, 97–99; 'Michael Albert interview', 17/4/07; G.Katsiaficas, 'Review of Howard Johnson's Holding the Center; S.Shalom, 'A flawed political biography', New Politics, Issue 23. ↑ November Actions youtube extract'. See also: MIT Museum photos of student activism, 1960s/1970s. ↑ Raymond, Eric S. "A Brief History of Hackerdom" . Retrieved August 11, 2008. ↑ "Massachusetts Institute of Technology". ROARMAP: Registry of Open Access Repository Mandates and Policies. UK: University of Southampton . Retrieved July 24, 2018. ↑ Bidgood, Jess (April 24, 2013). "On a Field at M.I.T., 10,000 Remember an Officer Who Was Killed". New York Times. Retrieved January 30, 2014. ↑ Faviero, Bruno B. F. (April 26, 2013). "Thousands attend Sean Collier memorial service". The Tech . 133 (21). Retrieved January 30, 2014. ↑ "Letter regarding the establishment of the Collier Medal". MIT News. November 25, 2013. Retrieved November 26, 2013. ↑ "Collier Medal". MIT Police. MIT. Retrieved November 26, 2013. ↑ Rocheleau, Matt (November 26, 2013). "MIT to establish a Sean Collier award". The Boston Globe. Retrieved November 26, 2013. ↑ "IBM and MIT partner on artificial intelligence research". ABC News . Associated Press. September 7, 2017. Archived from the original on September 7, 2017. Retrieved September 7, 2017. ↑ Gershgorn, Dave (October 15, 2018). "MIT is building a billion-dollar college dedicated to AI". Quartz. Retrieved October 16, 2018. ↑ Durant, Elizabeth. "Smoot's Legacy: 50th anniversary of famous feat nears". Technology Review . Retrieved August 13, 2008. ↑ "MIT presents updated Kendall Square Initiative plan to City of Cambridge". MIT News. Retrieved January 23, 2016. 1 2 "Kendall Square Initiative". kendallsquare.mit.edu. MIT. Retrieved April 6, 2016. ↑ "Letter to the community on East Campus/Kendall Square design firm selection". MIT News. MIT. September 23, 2014. Retrieved April 6, 2016. ↑ Abel, David (March 30, 2000). "'Hackers' Skirt Security in Late-Night MIT Treks". The Boston Globe . ↑ Chun, Matthew G.H. (April 14, 1999). "Bill Gates Donates $20 million to MIT". The Harvard Crimson. The Harvard Crimson, Inc. Retrieved April 6, 2014. 1 2 "MIT Facts 2017: MIT and the Community". web.mit.edu. Retrieved March 24, 2017. ↑ "Institutional Ownership Map - Cambridge Massachusetts" (PDF). ↑ "Names on Institute Buildings Lend Inspiration to Future Scientists". The Tech . XLII (70). December 22, 1922. Retrieved May 30, 2012. ↑ MIT Housing Office. "Undergraduate Residence Halls" . Retrieved October 1, 2010. ↑ Glatter, Hayley. 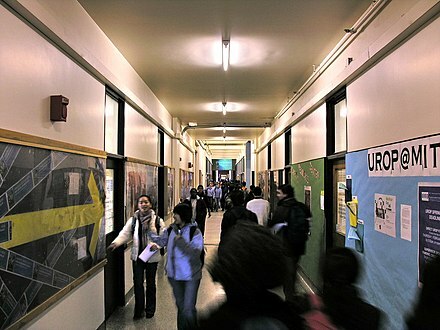 "Why Residents of MIT's Counter-Culture Dorm Have to Move Out". The Atlantic. Retrieved November 7, 2017. ↑ "FAQ on the newly established MIT Stephen A. Schwarzman College of Computing". MIT News. Retrieved October 24, 2018. ↑ "Massachusetts Institute of Technology". Roster of Institutions. New England Association of Schools and Colleges Commission on Institutions of Higher Education. Retrieved August 3, 2018. 1 2 3 4 5 6 7 "Enrollment Statistics". MIT Office of the Registrar. Retrieved June 26, 2012. ↑ "Boston Globe". Boston Globe. February 1, 1959. p. 51. 'Getting an education at MIT is like drinking from a fire hose' is generally attributed to former President Jerome Wiesner. However, in the 1 February 1959 (p. 51) issue of the Boston Globe, there is the following, "Quoting an MIT student Dr. [Julius] Stratton cited the quickening pace of science and said: 'Getting a technical education today is like getting a drink from a firehose.'" ↑ Keuss, Nancy (October 17, 2000). "The Evolution of MIT's Pass/No Record System". The Tech . 120 (50). Retrieved September 6, 2010. ↑ Maeroff, Gene I. (January 11, 1976). "Use of Undergraduates in Research Is Hailed by M.I.T. ; Inventions by Students". The New York Times . ↑ Palmer, Matthew (October 5, 1999). "An MIT Original, the Oft Replicated UROP Program Reaches 30 Years". The Tech . 119 (47). ↑ Mahoney, Matt (May 2012). "Unwritten Rules". Technology Review . Retrieved June 21, 2012. ↑ "Degrees Offered". MIT Facts 2017. Massachusetts Institute of Technology. Retrieved September 13, 2017. ↑ Avery, Christopher; Glickman, Mark E.; Hoxby, Caroline M; Metrick, Andrew (December 2005). "A Revealed Preference Ranking of U.S. Colleges and Universities, NBER Working Paper No. W10803". National Bureau of Economic Research. SSRN 601105 . ↑ Coughlan, Sean (September 15, 2014). "What makes a global top 10 university?". BBC News . It's the third year in a row that [MIT] ... has been top of the QS World University Rankings. The biggest single factor in the QS rankings is academic reputation ... calculated by surveying more than 60,000 academics ... Universities with an established name and a strong brand are likely to do better. ↑ "NRC Rankings" . Retrieved October 9, 2008. ↑ "MIT undergraduate engineering again ranked No. 1". MIT News Office. August 17, 2010. ↑ Morgan, John. "Top Six Universities Dominate THE World Reputation Rankings". "The rankings suggest that the top six- ... Stanford University and the University of Oxford – form a group of globally recognised "super brands". ↑ "Stanford and MIT lead THE arts and humanities ranking". Times Higher Education (THE) World University Rankings. Times Higher Education (THE). September 13, 2017. Retrieved January 26, 2018. ↑ "MIT SHASS: MIT named No. 2 university worldwide for the Arts and Humanities". shass.mit.edu. Retrieved January 26, 2018. ↑ "A Survey of New England: A Concentration of Talent". The Economist. August 8, 1987. MIT for a long time ... stood virtually alone as a university that embraced rather than shunned industry. ↑ Roberts, Edward B. (1991). "An Environment for Entrepreneurs". MIT: Shaping the Future. Cambridge, Massachusetts: MIT Press. ISBN 0262631415. The war made necessary the formation of new working coalitions ... between these technologists and government officials. These changes were especially noteworthy at MIT. ↑ Simon, Jane (July 1, 1985). "Route 128: How it developed, and why it's not likely to be duplicated". New England Business. Boston. p. 15. Compton co-founded in 1946 what is believed to be the nation's first venture capital company. ... [He] and a group led by a Harvard professor [Doriot] founded one of the first venture capital companies, American Research & Development Corp.
↑ "Industrial Liaison Program: About Us". MIT. 2011. Established in 1948, the ILP continues ... making industrial connections for MIT. ↑ "MIT and Imperial launch 'unparalleled' student exchange | Imperial News | Imperial College London". Imperial News. Retrieved March 21, 2018. ↑ "MIT expands partnership with Imperial College London". MIT News. Retrieved March 21, 2018. ↑ "About Us". Technology Review . MIT. Retrieved June 5, 2012. ↑ "MIT Museum: Mission and History". MIT. Retrieved May 15, 2013. 1 2 "Research at MIT". MIT Facts. MIT. Archived from the original on August 2, 2010. Retrieved July 1, 2012. ↑ Edgerton, Harold "Doc" (November 28, 2009). "High Speed Camera" . Retrieved November 28, 2009. ↑ Hilts, Philip J. (March 31, 1998). "Last Rites for a 'Plywood Palace' That Was a Rock of Science". The New York Times . Retrieved October 4, 2010. ↑ Hardesty, Larry (September 17, 2015). "Personalized Heart model" . Retrieved September 21, 2015. ↑ "MIT 150: The Top 50". Boston.com. ↑ "50 Things (That MIT Made) - MIT Admissions". MIT Admissions.